Terry Hester, right, speaks with attorney Bill Armintrout, left, during a Wednesday hearing in Highland County Common Pleas Court. This story has been updated to reflect the correct names of two co-defendants. A stack of criminal cases is growing in Highland County Common Pleas Court against two Greenfield men who are accused of burglary, theft and related crimes — the victim in the latest case being the father of the county prosecuting attorney. Tyler Trent, 30, and Terry Hester, 35, who were both indicted Tuesday in two separate cases for burglary, theft, breaking and entering, and receiving stolen property, were arraigned Wednesday before Judge Rocky Coss. Meanwhile, two other theft-related criminal cases filed against Trent and Hester are still pending in common pleas court, and Highland County Prosecuting Attorney Anneka Collins said more are expected to be filed in coming months. Trent was also indicted Tuesday for aggravated possession of methamphetamine. In the most recent case filed against Trent and Hester, the state alleges that Trent, Hester and Taylor Kay Jenkins, 23, also of Greenfield, stole and sold items from a barn dwelling owned by Dave Fairley. According to an affidavit filed in the case, Fairley is Collins’ father. Chad Randolph of the Clinton County Prosecutor’s Office has been appointed a special prosecutor in the case. Also charged in the indictment is Brandon Green, 32, of Greenfield, who is accused of selling some of the items the others allegedly stole. The indictment says three of the four co-defendants — Trent, Hester and Jenkins — broke into an apartment in a barn owned by Fairley and stole a .22 revolver, a Bible, $150 in one dollar bills, a flashlight, four rings, John Deere pocket watches, a BB/pellet gun, DVDs, two Verizon tablets, a laptop, a 4-H knife and a black bathroom kit, among other items. The defendants were identified by the car they drove during the theft, which was caught on surveillance footage. Each of the first three defendants were indicted Tuesday on one count of second-degree felony burglary, one count of third-degree felony burglary, one count of third-degree felony theft, one count of fifth-degree felony theft, and breaking and entering, a fifth-degree felony. On Wednesday, lawyer Anthony Baker of West Union was appointed to represent Trent, who appeared in court via video from the Highland County jail. Hester, who appeared in court in person, is represented by local attorney Bill Armintrout. In total, Trent has five cases pending against him in Highland County Common Pleas Court, and Hester has three, according to online court records. Trent and Hester are co-defendants in three cases. Hearings in the cases previously filed against Trent and Hester were delayed to later dates on Wednesday. 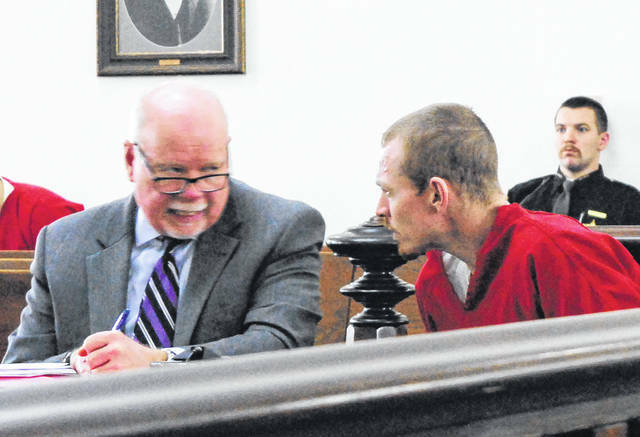 https://www.timesgazette.com/wp-content/uploads/sites/33/2019/02/web1_f-court-1.jpgTerry Hester, right, speaks with attorney Bill Armintrout, left, during a Wednesday hearing in Highland County Common Pleas Court.